Maintaining a thick beard is no joke. It involves a lot of combing to stay neat. Since you can’t just use any kind of comb, we’re giving you a list of the best beard combs in today’s market. Since you’re already set to purchase a beard comb, we recommend buying a grooming kit instead to really get your money’s worth. Grow A Beard Brush & Comb Set is pocket-sized so you can bring it anywhere in your pocket or bag. It is ideal for men who are always on the go. Regarding the material, this comb is made of bamboo to remain durable for years. More importantly, it is effective in making facial hair smooth and shiny. It turns out that wood is great for massaging your beard to stimulate the production of natural oil. Additionally, this beard comb can easily remove dirt from your facial hair. It can also detangle your beard even when wet because of its anti-static feature. As you can see, the product is packaged in an elegant black box. That’s why it’s an excellent gift for anniversaries, birthdays, Father’s Day, and other special occasions or events. Symmetry is the focus of The Beard Black Shaping & Styling Comb. It can help you trim your beard in perfect shape quickly. Its whole structure serves as a template. And, of course, let’s not forget about the built-in teeth of the comb sections. It may be inconvenient for simple combing but for professional grooming at home, you’ll surely appreciate the unique design. 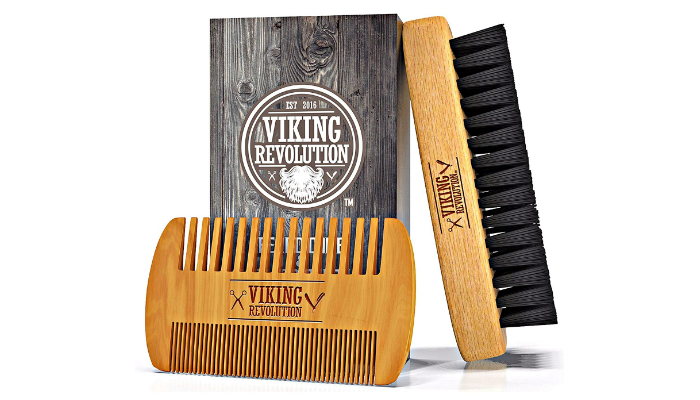 Just like the top product, Viking Revolution Beard Comb Set is also a convenient grooming kit. However, its packaging is more interesting because of the wooden look of the box. The material is also different. This beard comb is made of pearwood with a portion of bamboo. That will make it easier for you to spread oil, pomade, balm, or conditioner all over your facial hair. 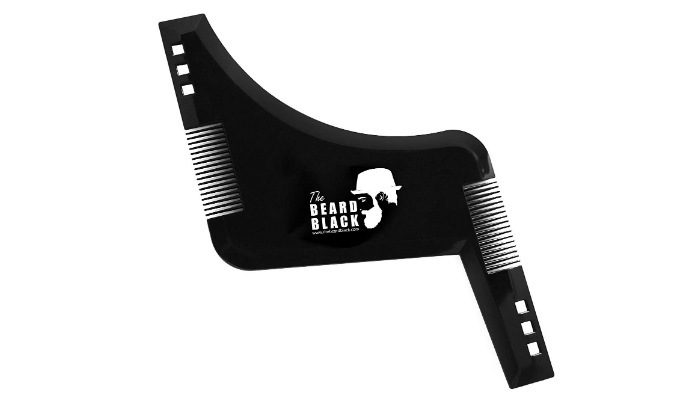 Another styling template with a built-in comb, BEARDCLASS 8 in 1 Beard Shaping Tool is multipurpose for your convenience. 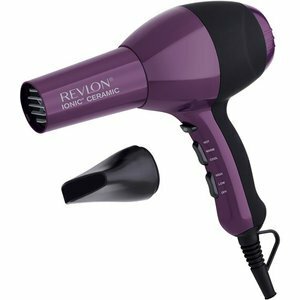 It can help you achieve any style you want without using several tools. Unlike the first multipurpose tool we discussed, this one is completely transparent. It aims to guarantee precision while you’re trimming your beard. As a plus, this product comes with a pair of beard scissors, a mustache comb, and a keychain. 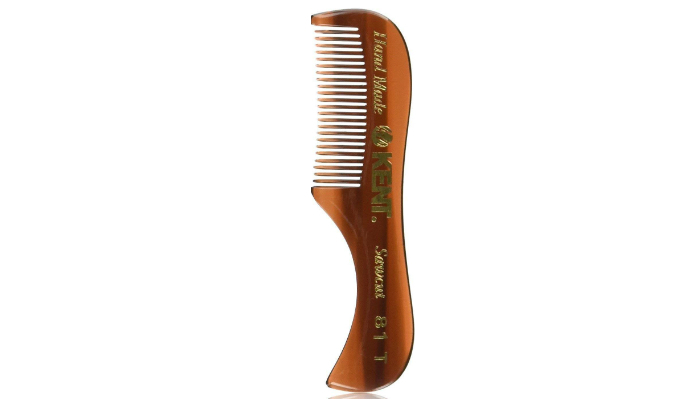 The unique thing about Kent 81T- Men’s Handmade Beard Comb is its handle. 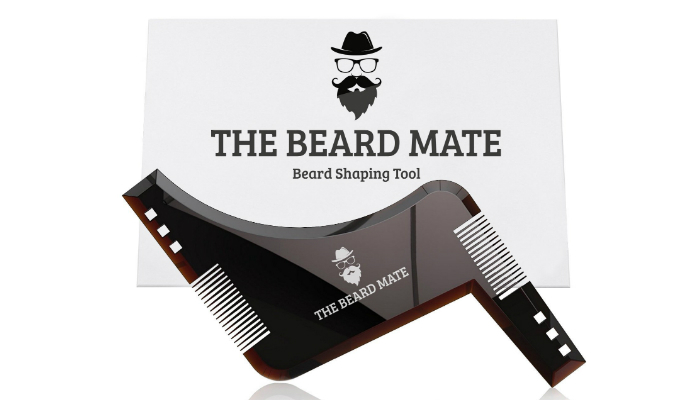 Surely you’ve noticed already that beard combs usually come without handles, making this product a must-have. This option actually looks like a regular comb but much smaller to really penetrate your beard’s strands. It clearly has fine teeth for better results. If you prefer buying a template comb, here’s a cheap option for you. Despite the low, low price of The Beard Mate Shaping & Styling Tool, it remains as a high-quality product that guarantees convenience when you groom your facial hair. Even though the two beard combs have the same teeth design, this feature has a purpose. 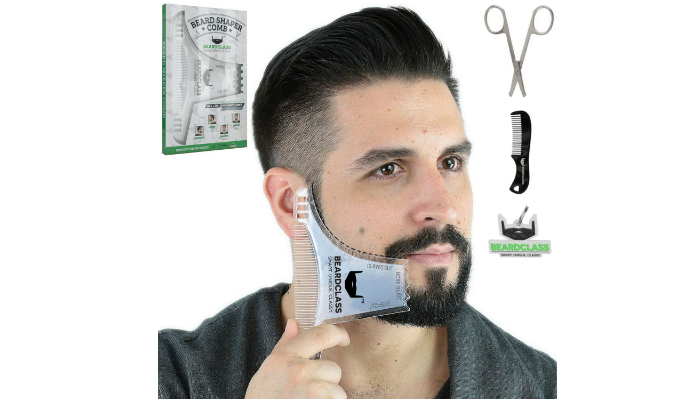 You’ll be able to comb your beard no matter how you position the template. The best beard combs generally have well-designed teeth and high-quality materials. However, because of multiple selections, you might have a hard time choosing the right one for your preferences. That’s why we have this buying guide to help you. Luckily for you, there are only two factors deemed crucial in selecting a beard comb. You just have to think about the material used and the teeth’s design. We’re telling you right now that plastic beard combs can be ineffective for styling. They can even be harmful to your facial hair because of static. Static is the common cause of beard thinning and breakage. While other plastic options are made of the highest quality possible, it’s best if you avoid them in general if you don’t know which brands are trustworthy. Another material that produces a lot of static is metal. Metal beard combs definitely look edgy and masculine, but a lot of them will just ruin your facial hair’s style. What’s left are rubber and wood. These two materials are highly recommended. Rubber beard combs technically consist of vulcanite or cellulose acetate. 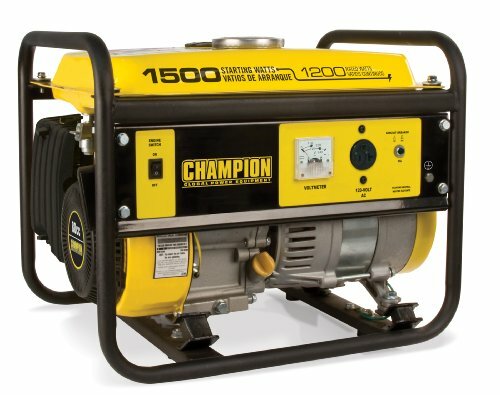 Because of their smoothness, they don’t create static. Their smooth surface is also the main reason why cleaning them is a breeze. Saving the best for last, wood beard combs are very popular since they’re the safest and most effective options. Nothing beats natural materials. To be more specific about the benefits of wood, this material can easily spread natural oil throughout your beard. It definitely produces zero static. Just make sure the comb’s finish is 100% smooth to avoid hurting your skin with splinters. Notice how beard combs differ when it comes to their teeth? Some have wide gaps while others are too close together. Honestly, we can’t say which design is better. That’s why our top product features a comb with two different sides. 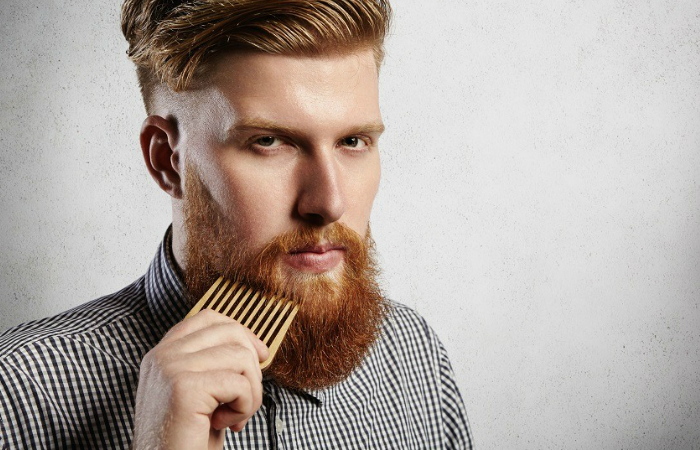 Since beard combs are used for detangling and styling, using both wide and narrow teeth every day can significantly improve your look. Wide teeth are for detangling while the narrow ones are for shaping. Fine teeth are also great for making your beard shinier and smoother. 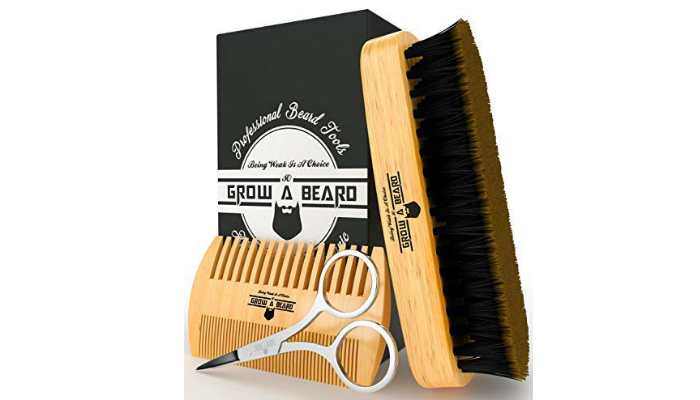 Because of its two different teeth sections and high-quality bamboo material, Grow A Beard Brush & Comb Set is our number one choice among the best beard combs. It is a small grooming kit you’ll love to bring anywhere you go. For more products you might like, check out the best beard grooming tools every man should have. You should also maintain your facial hair with a daily dose of beard oil for a healthier look. If ever you decide to shave off your beard, find out if you may use a trimmer. To avoid ingrown hairs, should you stop using electric shavers?